Laguna Beach with its miles of beach front Real Estate or homes with uncomparable ocean and beach views is often a top destination for people looking for that Orange County beach lifestyle. 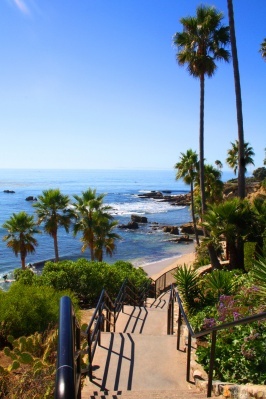 Laguna Beach is well know not only nationwide but worldwide for its spectacular beaches, and the beach front and water front homes are as spectacular as you can imagine with different styles of architecture for all tastes,given that many if not most of the homes here are custom made. You'll enjoy watching the waves, admiring the sunsets and even panoramic views of Catalina island nearby. We are pleased to show you all Laguna Beach Beach Front and Ocean Front homes listed currently for sale, enjoy! If you would like to read more about Laguna Beach Beach Front Homes, please follow the link. Centrally located on the sand in the heart of Laguna Beach, this jewel of real estate sits on one of Orange County’s most picturesque beaches. This beachfront property boasts spectacular sunset views of Catalina and San Clemente Island. Masterfully redesigned, this home exudes the finest finishes one expects to find in a property of this caliber. Entering into this property one is immediately mesmerized by the sapphire effulgence of the Pacific.